Smartphone sales growth is slowing to less than 10 percent annually to 2018, and mobile networks saw just 5 percent growth in the last decade. So while Apple continues to knock it out of the park and Xiaomi skyrockets, mobile Internet is the mobile growth market. Digi-Capital now forecasts almost 3x revenue growth from $300 billion last year to $850 billion by 2018. The market Apple spawned could generate more revenue within three years than even its own mighty market cap today. Despite huge scale and growth, mobile is still evolving. M-commerce remains the primary engine of growth, which is why VCs bet more than half of $41 billion invested in mobile in the last 12 months into m-commerce-related sectors. Mobile advertising is set to leapfrog in-app purchases to move from third to second place in the revenue hierarchy by 2018, as app developers rebalance their business models to capture new opportunities. Enterprise mobility growth continues, although not as fast as the consumer market. Finally, the Apple Watch is helping the wearables sector to gain deeper penetration and revenue. M-commerce is the undisputed heavyweight champion of the mobile world, with over $200 billion m-commerce sales last year. 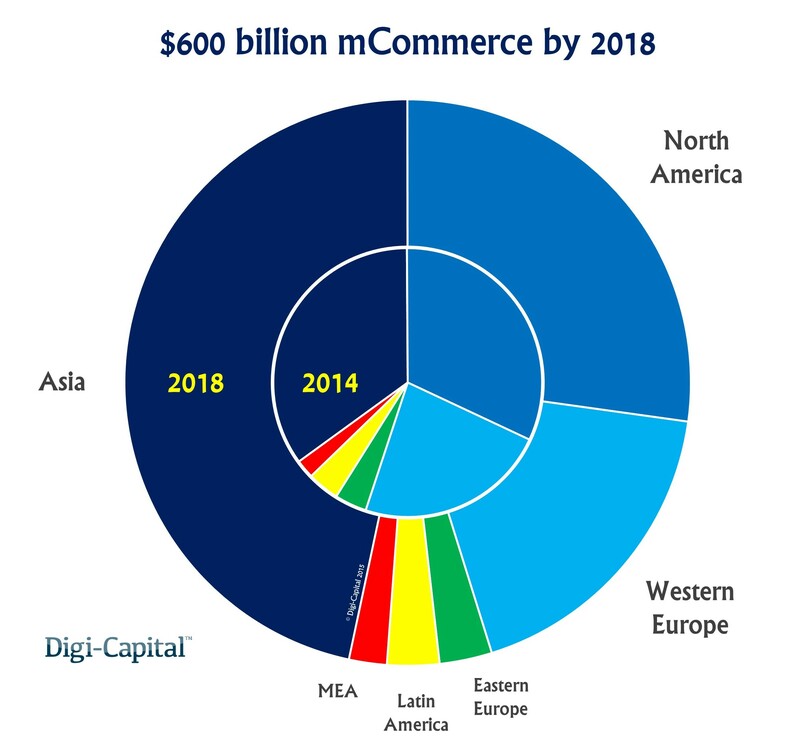 Asian m-commerce also passed America in 2014, and by 2018 Asian users will account for almost half of over $600 billion spent on goods and services using mobile devices. Asia’s larger population and growing mobile middle class have outpaced U.S. mobile shoppers, despite America’s higher spend per person. The rise of Alibaba, Flipkart and others highlights that m-commerce is no longer just the domain of familiar giants like Amazon and eBay. Established offline retailers are also showing m-commerce’s value. Wanda E-commerce, a joint venture of retailer Dalian Wanda, Tencent and Baidu, became worth over $3 billion within four months of being founded and before it had sold anything. Last year mobile advertising was the little brother to in-app purchases and paid apps, but Facebook and others have begun to change the balance in advertising’s favor. Mobile ad spend could top $85 billion by 2018, growing at a faster rate than m-commerce to pass in-app purchases and paid apps revenue. 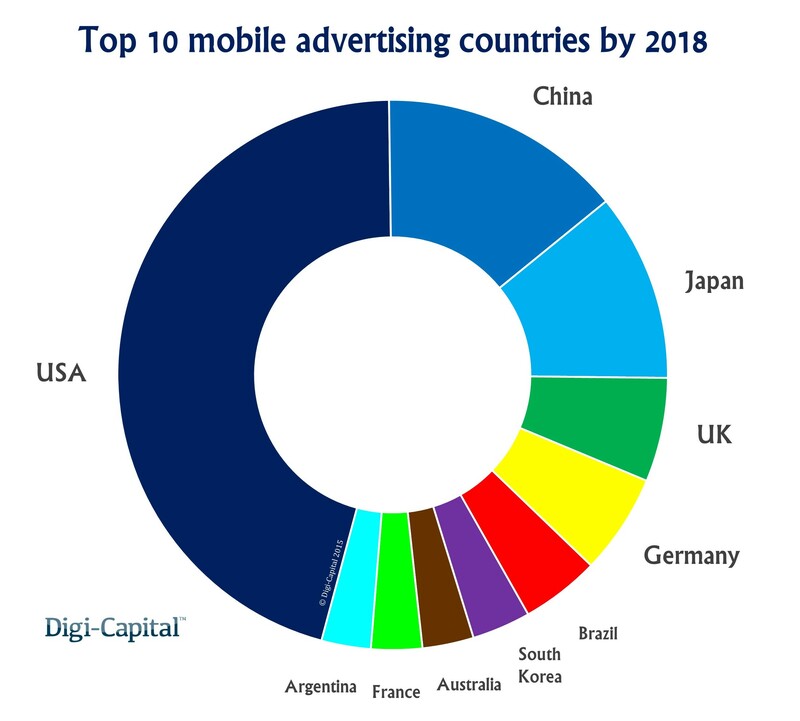 Unlike Asia’s lead in m-commerce, mobile advertising will remain a market where America dominates because of the higher spend by American advertisers. 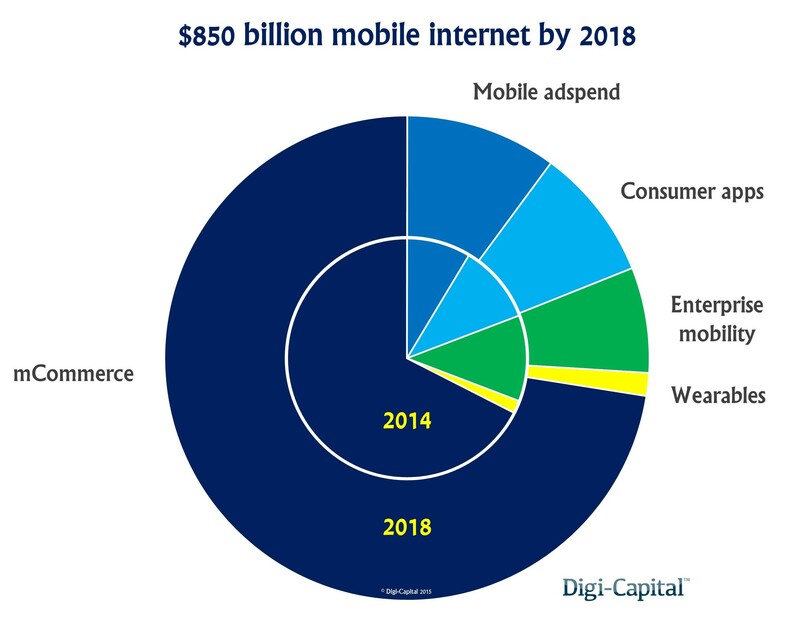 American mobile ad spend will be higher than China, Japan and South Korea combined by 2018. As mobile advertising becomes increasingly native, the gap between mobile usage and mobile ad spend share is closing rapidly. 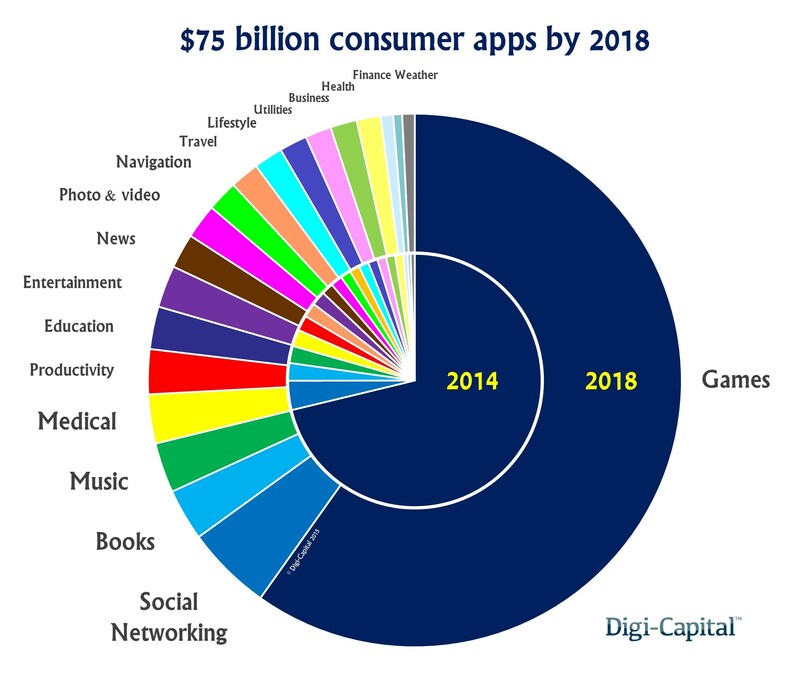 Consumer apps revenue will grow from over $30 billion in 2014 to $75 billion by 2018. Games took around three-quarters of global app revenues last year, when Android passed iOS revenue (including Chinese Android app stores) for the first time. Higher growth rates across sectors other than games could drive non-games revenue share to almost half by 2018. App-as-a-Service subscription models are also supplementing the in-app purchase model for dominant free apps. Mobile Internet is only eight years old, having disrupted the market more rapidly and fundamentally than the original web 20 years ago. While the top-grossing charts are relatively mature, rapid growth and change across the rest of the market means there is still a lot to play for.